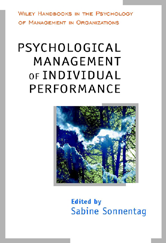 Psychological Management of Individual Performance is a unique combination of contributions from an academic and a practitioner for each topic. Leading international authors come together in this integrative and comprehensive handbook, to combine academic research findings and to provide detailed practice-relevant information, on subjects such as performance concepts, work design, cognitive ability and personality as predictors of performance, performance appraisal and potential analysis, goal setting, training, mentoring, reward systems, strategic HRM as well as broader issues such as well-being and organizational culture. This Handbook is a valuable resource for researchers, academics and advanced students in psychology and related fields; as well as consultants, practitioners and professionals in HR, who want to contribute to the enhancement and maintenance of high individual performance.